Various dermatologic conditions affecting the skin can cause itchiness and rashes, but only some are related to an allergy. There are many types of skin allergies and rashes that can cause itchiness and inflammation. However, not all rashes that itch are related to skin allergies. For example, insect bites and autoimmune conditions along with fungal, bacterial, and viral infections can all cause a rash to appear. While there may be other causes behind your rash, allergic reactions are still among the most common causes of skin rashes. The following are the most common types of allergic skin rashes. Atopic dermatitis, more commonly known as eczema, frequently occurs in young children, although it may start in young adults, and can continue into adult life. The rash of atopic dermatitis, often called eczema, occurs where a person scratches. In infancy, the rash occurs on the chest, cheeks, and scalp, where the child is able to scratch. Older children and adult typically have the rash in the skin folds of the elbows and behind the knees, although may also occur on the ​face, neck, hands, feet, and back. 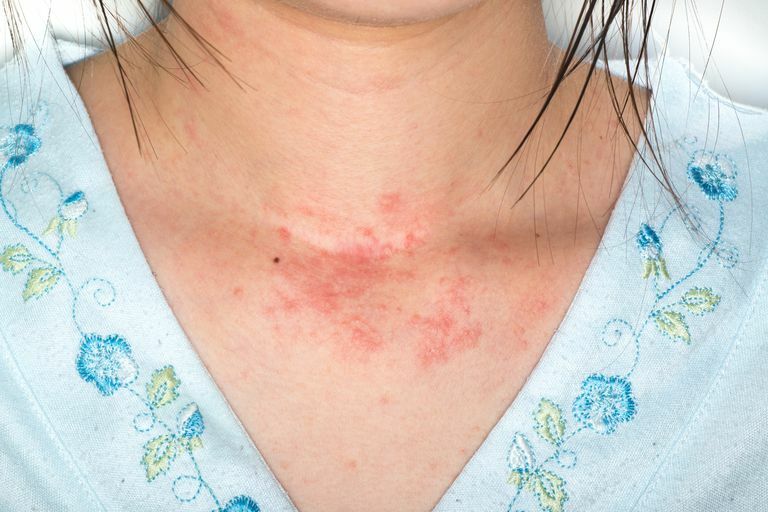 The rash is red, often flakes or oozes, and has small blisters or bumps. There are often excoriations, or areas of broken skin, from aggressive scratching. While there are at-home treatments for eczema available, atopic dermatitis has been linked to food allergies in children, so a thorough evaluation by an allergist/immunologist may be in order if you or your child experiences this type of rash. Urticaria, commonly referred to as hives, is an itchy rash that can occur at any age. This rash appears as raised red bumps of various shapes and sizes and typically lasts for only minutes to hours. While it can be very itchy, a person will generally not excoriate (scratch to the point of breaking the skin and cause bleeding) themselves. Urticaria can be acute (lasting less than six weeks) or chronic (lasting more than six weeks). The swelling that sometimes goes along with urticaria is called angioedema and often involves the lips, the eyes, and the hands and feet. Angioedema is usually not itchy or red; it tends to burn, sting, or cause a tingling sensation. In rare cases, severe swelling that blocks the ability to breathe can develop. This is a medical emergency known as anaphylaxis, which can be life-threatening. Contact dermatitis is caused by direct skin contact with a substance that causes a rash-like reaction. People react to a variety of chemicals, including cosmetics, hair dye, metals, topical medications, and dental materials. An example of a contact dermatitis is a rash from poison ivy, which is an extremely itchy and appears as blisters that ooze and crust after contact with plants of the Toxicodendron family. A contact dermatitis rash may look like atopic dermatitis, but the rash is typically located only in the area of contact with the offending chemical. Common locations include the face, especially the eyelids, neck, hands, and feet. Contact dermatitis to metals, such as in jewelry or snaps/buttons/zippers on clothing, commonly occurs on the neck, wrists/hands, piercing holes, and at the waistline. Contact dermatitis can be diagnosed through a patch test, though it can be difficult to determine the cause. Atopic Dermatitis Practice Parameters. Ann Allergy Asthma Immunol. 2004;93:S1-21. Practice Parameters for Disease Management: Acute and Chronic Urticaria and Angioedema. Ann Allergy. 2000; 85: S525-44.